The cloud has, without a doubt, become one of the most powerful assets to a company's infrastructure. Access to and support for cloud environments can help spur productivity and ensure that employees can utilize the most advanced tools in a way that increases collaboration and enterprise success. In this corporate landscape, more and more IT employees are seeking certifications that will help them better understand the inner workings of today's top cloud technology. A cloud-aligned class can make a great difference, not only for your individual career, but for the overall well-being of your organization. Among the available cloud-related certifications is Microsoft Azure, including courses revolving around solutions architecture and web applications. A Microsoft Azure certification is a significant boon and can even help set you apart from others in the technology field. 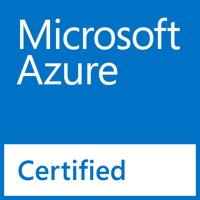 Why consider a Microsoft Azure certification? According to several industry experts, Microsoft Azure has quickly become one of the most popular cloud platforms in use today. MSPowerUser reported that although Amazon Web Services has leading command of the infrastructure-as-a-service marketplace today, that could change within the next few years. A 2016 survey of American and European chief information officers found that by 2019, Azure would surpass AWS in terms of IaaS market share, and would do so by over 30 percent. What's more, Synergy Research Group found that Microsoft had the second highest year-over-year growth in the global cloud infrastructure services market. What do all these figures mean for your business? In a nutshell, chances are good that within the next few months or years, your company will be among the many utilizing a Microsoft Azure-based cloud solution. And if you have expertise in this area, it can be considerably beneficial for the deployment, maintenance and overall usage of these critical technological assets. "The growth of the market is good news for Microsoft as they pivot increasingly to a cloud company, and it seems in many ways the more important [the] cloud becomes, the more companies wish to turn to trusted vendors such as Microsoft," MSPowerUser pointed out. When one factors in the robust capabilities and features that an Azure solution can provide, it's easy to see why Microsoft is taking a commanding lead of the marketplace. Even before its entrance into the cloud sector, Microsoft was a well-respected name with a robust standing in the technology industry, and Azure is only helping to propel that reputation. One of the best things about Azure services is the fact that many employees are already familiar with their usage. Microsoft provides a leading user experience, and many platforms provide easy-to-use tool sets that align with functionalities that users already understand how to leverage. In addition, AAJ Technologies contributor Ed Kirchmier noted that Azure solutions can be closely integrated with other Microsoft solutions, offering a more unified IT system. "Investing in a cloud platform that seamless integrates with Microsoft products makes sense," Kirchmier wrote. "Organizations can also use the same virtual machines in Azure that they use on-premises, like Windows and Linux, which further simplifies operations. Many industry experts expect Azure to slowly but surely gain adoption due to this ability to offer users a completely seamless and integrated service package." If New Horizons Learning Group's offerings are any indication, there are a wide range of Azure-related courses available for you to choose from. These include more basic classes that help inform you on the fundamentals of Azure, to courses revolving around development, architecture, design and implementation. This means that no matter where you're at in your IT career and what types of skills you have, there is a course that will be beneficial to your professional development. Microsoft's own Born To Learn Blog highlighted three courses in particular for those looking to become an Azure specialist. According to Microsoft's Veronica Sopher, Developing Microsoft Azure Solutions, Implementing Microsoft Azure Infrastructure Solutions and Architecting Microsoft Azure Solutions are some of the most ideal courses available. "Earning any kind of specialist certification is a great way to stand out from the crowd, whether you're looking for a new challenge, a new job, or a way to make yourself more valuable to your current employer," Sopher wrote. "With the growing importance of the cloud, Azure is a must-have certification for anyone looking to prove their skills." If we haven't convinced you yet, take a look at this piece from Chris Pietschmann, who recently earned his Azure Solutions Architect certification. "Microsoft has really built out an incredible, cloud platform that is Azure!" Pietschmann wrote. "And, this is fitting since it's the future of Microsoft's Enterprise business. This is the root of the reason why I decided to pursue and obtain the MCSD: Azure Solutions Architect certification." PowerShell is Critical for Office 365 Admins - But Why?